World Football Commentaries: Part 2: "At the Origins of the Phenomenon Mourinho: 'How I Became Special 1' "
Part 2: "At the Origins of the Phenomenon Mourinho: 'How I Became Special 1' "
An interview between Christian Panucci and Jose' Mourinho on Sky Sports/Italy in February 2011. CP: Your players said that they trained simulating the Sunday match during the week. JP: It's true. In that moment, at Porto, we had the possibility to do this because in Portugal there are fewer games. Only one Cup and the chance to better organize the games. To choose when to play. If they wanted to play on Monday and rest an extra day, they played on Monday. If they wanted to play on Friday before playing a Champions League match, they could play on Friday. In Portugal, there's this possibility by the club to choose. Television doesn't control the situation. And we did this often. I knew that my team wasn't a side with players of great experience and with a great tactical culture, and it was important for us to do this type of work. It was people with a very great knowledge of their own qualities and limitations. A team that could hide its problems and where each one of them was capable to fight for the rest. A fantastic team with men who remain in my heart, just like all of the others, but I grew up with them. I arrived at the first Champions League with them. And people that in this time are practically the same age as I and have just about finished their careers. But they will be brothers for a lifetime. CP: Ettore Messina (coach of the Real Madrid basketball team) said that he thought in basketball, the hazard was lesser, but after talking with you, he understood that also in football, you reduce the danger as the manager. JM: I look to do that. Ettore was here and both of us are coaches at Real Madrid, but the spatial distance where we work is enormous. We are very far apart. He came here once with his assistants, and I always had a great level of curiosity to know how they work in other sports. For example, basketball is a sport where you can think and learn. I decided to completely open the door to Messina to let him see how we work. We have a far-less organized scouting department and preparation of the games and analysis of opponents and of our own performance. I opened the door to Ettore who understood that we work seriously and very hard. He understood this and made me happy because many people have the sensation that in football, we live only on the talents of the players. And it seems to me that in today's football, where all of the teams have great players, great coaches and are prepared well physically, it seems to me to have this type of organization can make the difference. CP: In the Super Cup match against AC Milan, the second half of your Porto gave the image to Europe that Porto, a year after being in the Champions League, was able to do something great. JM: Yes. We lost because Milan was Milan and you know that Milan knows perfectly well how to obtain a result. They scored in the opening minutes with a header by Shevchenko at the far post, but afterward, we played and dominated the game and in the second half we could have easily scored. Even I had that feeling. They wanted to obviously win the Super Cup; however, after having lost, I was still happy for this feeling. The next year, if we played another time against Milan, we could have won. And you know if you can win against Milan who was European champion, you can beat any team. This was the most important feeling for me and the players. Because when you win a UEFA Cup, we played against Celtic in the final, against Lazio that was a great side and we won very well in the semi-final. But when you lose against Milan and feel that sensation, you can say you are ready for the Champions League. Montecarlo was not a Cup final that was lost, but the start of the self-esteem and confidence that we could win and compete without fearing anyone. CP: When I played in London, Chelsea was beginning to show itself (in European competitions). Then you arrived and changed it. JM: I know the history of Chelsea very well and you played in a great Chelsea side. I think that in that time, if Chelsea had the money of Roman Abramovich to buy two or three of the right players, it could have made a difference. Your Chelsea side could have done it. Later, there was a negative transition period, because there were the funds provided by Roman, but the wrong choices. And for two or three years, Chelsea had Roman's money and his desire to make history at Chelsea, two or three players when you played weren't there and they were still fantastic. For example, Frank Lampard for me is from another planet in English football, but Chelsea was missing something and for me something arrived when we came. A different type of leadership. I'm not humble and you know it; a diferent type of psychological preparation for the team and to utilize Roman's money to buy two or three players that were missing to make the team really a top side. And with Roman's money and the group we had, we made a traumatic change in a positive sense that allowed us to win the League two years on the trot and many other Cups. And more than this, a team for the future because Chelsea now has exactly the same players that we had in 2004 and 2005. Anelka arrived, Ivanonic came, but Chelsea is exactly the same team. And last year, Carlo Ancelotti won again and now Chelsea has a team for two or three more years. CP: Your rapport with Roman Abramovich? JM: The time we worked together was fantastic and still is now. With him, with Massimo Moratti (at Inter), with Pinto da Cosa at Porto. Now it's not been long that I've been in Spain, but I hope to be able to say the same about Florentino Perez. I never had problems and I've always been honest. And when you are honest at times you have to tell your President things he doesn't want to hear, but it's better that way. I learned a great deal and I also believe that I gave them a little bit of collaboration to be better in their presidencies. CP: I never had a good relationship with the media. Above all, because I don't like to talk a lot. Even if now I'm a commentator. You have always been someone who spoke your mind to everyone, but in England, you always had a great rapport with the journalists. JM: It's completely different. You have a completely different life. At Chelsea, you didn't have the same training center that we had but training sessions were open to the public. There were zero journalists, zero fans and absolutely nobody. A completely different story. I came to a press conference and nobody wanted to know who was playing, why others didn't play, the tactical system I used. Nobody wanted to know this. They only wanted to look for two or three words to make the back page of The Sun, Daily Mirror, etc. Everything was much easier. In Italy, it is stressful, but it's beautiful. CP: I've had a few discussions with various managers. How would you have done this with me? JM: I like discussions and I like opinions. There are players in which it is not easy to have a verbal exchange. There are defenders who are too defensive for these levels. There are others who are completely open and I like it. I always say: You learn with players, by their questions. You learn by their opinions, they make you think and for me, I've always liked it. I believe that a team needs at least three or four players with this type of character who bring doubts and make people think. I really like this and from my assistant coaches, I always expect this. From my players, principally in front of the group, there are players who are a little less defensive. But I really like when you hear that a player doesn't want conflict, but what he wants is to reach a solution and you want the same. To win and bring something extra. 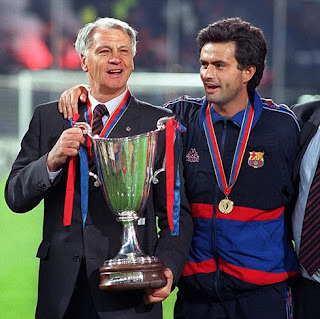 Part one of this translated discussion covers Mourinho's youth in Portugal, his early years as a school teacher with special-needs children, his decision to become a football manager, the influence of Sir Bobby Robson and Louis Van Gaal, along with his first years in professional management at Benfica, Leiria and Porto. 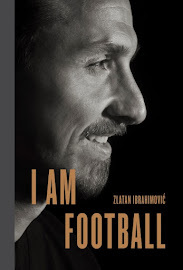 A reader at World Football Commentaries was kind enough to provide another link to the interview. Here was an interesting quote about Mourinho's potential American future. CP: Would you like to have an experience in South America? JM: I don't think so, because at this time in my career, I can be a little selfish and think about myself and remain at the top of European football for the next 10 to 15 years. Later, I see a distant experience. An experience in a completely different perspective in football. The United States: New York Red Bull. Los Angeles Galaxy. A house in Manhattan; a house in Malibu. I'm going a little more in this direction. Source: http://sportemotori.blogosfere.it/2011/02/mourinho-linter-le-manette-e-il-rapporto-con-moratti-un-giorno-devo-tornare.html, February 7, 2011 by Silvio De Rossi. Thanks, it's better than google translate! Can I copy the English parts and put them on my (barely read) blog? You can use a few excerpts; however, I would kindly ask that you provide a link back to the interview and credit me as the translator. Please do not copy the entire translation. I would post a tidied up version of the google translation but obviously yours is slicker. There's actually more of this interview, is he actually saying he thinks part of the reason he didn't win a third title with Chelsea was for commercial reasons? "Mi riferivo al sistema. In Inghilterra si parla di fair play, di un calcio pulitissimo ma ricordo sempre che quando abbiamo vinto due campionati con il Chelsea, nella terza stagione, si sentiva che per ragioni commerciali, di sponsor, per ragioni televisive a livello mondiale, una squadra che avesse vinto per tre anni consecutivi la Premier League, la cosa non era come prima". "I was referring to the system (when he made the shackled hands gesture at Inter.) In England, one talks about fair play and a very proper football. But I always remember that when we won two championships with Chelsea, in the third year, one sensed for commercial reasons, for the sponsors and television rights (he said 'TV reasons') if the team won the Premier League for three years on the trot, the situation wasn't like before." Please send me a link to your blog and/or write to me at info@sanstefano.com to discuss this further.